Is 'Avengers' Shooting in Lakewood? But there is a movie being made tonight at the corner of Detroit Avenue and Lakeland. The film is called Beautiful Garden. The film is by Cleveland native Chris Peplin, who wrapped Beautiful Garden earlier this year, and is now doing pick-ups (extra shots) to complete the film. Peplin grew up in the Cleveland area and, at an early age, realized his calling. He studied film at Cleveland State, worked a few internships and then decided to fast-track his career by moving to L.A. to attend The New York Film Academy. After completing the 12-month program, he carried the filmmaking torch back to the Midwest. 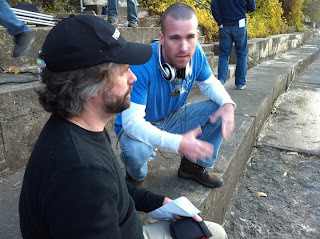 Midwest Movie Maker reporter Peter Balint interviewed Peplin in February. Read more about the filmmaker and the movie.